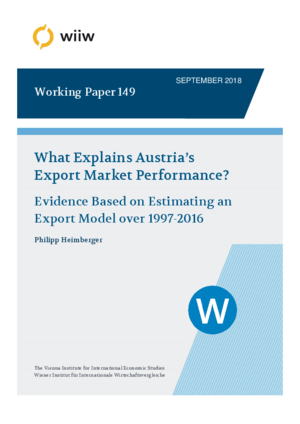 This paper analyses Austria’s export market performance by exploring four channels that can impact on exports: a) cost competitiveness, b) ties to trading partners through their demand for import goods, c) global investment demand, and d) offshoring of goods production. By using cointegration analysis and error corrections, we estimate an export model based on quarterly data over the time period 1997-2016. The main results underscore that it is not only price competitiveness that inﬂuences Austria’s export performance, as global export demand and trading partners’ demand for capital goods are shown to have a signiﬁcant long-run impact on Austrian goods exports. Cost competitiveness does play a role in determining export market performance, but over the last twenty years the relative contributions of changes in the real effective exchange rate based on unit labour costs to export growth are shown to be relatively small. While Austria’s international competitiveness has only recorded small variations since the ﬁnancial crisis, this paper provides evidence that lower export growth and the falling global export market share of goods since 2007 largely reﬂect relatively weak economic activity of many of Austria’s important trading partners including Eastern Europe.